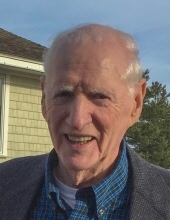 Donald Michael Wilson, 82, beloved husband of Kathleen (Dunn), passed away on Thursday, April 11, 2019 after a brief illness. Born in Boston on November 25, 1936, he was the son of the late William C. and Mary I. (Burbank) Wilson. Don was raised in Beverly and was a graduate of Beverly High School class of 1954. An honorably discharged veteran, he served his country during the Korean Conflict as a member of the United States Air Force. In 1958, Don married his high school sweetheart, Kathleen, and the couple settled in Beverly Farms to begin their lives together. Don was avid golfer, a long-time member of the Beverly Farms Golf League and Wenham Country Club. He was a life-long parishioner of St. Margaret Church and served as a Grand Knight with the Knights of Columbus. Don was a loving and dedicated husband, father, grandfather, soon-to-be great grandfather and friend. He will be sorely missed by all who knew him. In addition to his wife of sixty years, Don leaves his children: Bud Wilson and his wife, Sherry Lopes of Fairhaven, Rick Wilson and his wife, Jean of Beverly, and Mary Garvey and her husband, Hank of Newburyport; his grandchildren Stephanie Ladd and husband, Kevin, David Wilson and fiancé, Jen, Olivia Wilson and partner, Glenn, Patrick Wilson and fiancé, Rachel, and Hank Garvey IV. Don also leaves numerous sisters-in-law and brothers-in-law as well as many nieces and nephews. Don was pre-deceased by his siblings: William, Jr., Richard, John, Irene, Joanne, and Frances. To send flowers or a remembrance gift to the family of Donald Michael Wilson, please visit our Tribute Store. "Email Address" would like to share the life celebration of Donald Michael Wilson. Click on the "link" to go to share a favorite memory or leave a condolence message for the family.